Azerbaijan Caspian Shipping Company (ACSC) held a meeting with Konstantin Palnikov, the General Director of the Russian Maritime Register of Shipping (RS), which is one of the well-known classification societies. During the meeting, the current state of cooperation between ACSC and RS was discussed. Chairman of the Shipping Company Rauf Veliyev informed the guests about the work carried out in the Shipping Company for the last 4 years. It was noted that maintaining the technical condition of the fleet vessels is one of the main conditions for the implementation of strategic objectives. 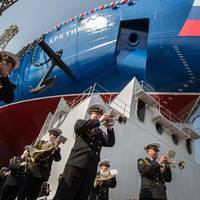 Russia has unveiled Arktika, touted as the world’s largest and most powerful nuclear icebreaker, during a launching ceremony on June 16 at Baltic Shipyard in St Petersburg. The 173 meter long, 34 meter wide Arktika is the lead nuclear icebreaker ordered by Russia's Rosatom state nuclear agency for navigation through the Northern Sea Route, and more specifically the delivery of hydrocarbons to Asian markets. “There are no analogs of the icebreaker such as the Arktika in the world,” said Rosatom CEO Sergey Kirienko at the launching ceremony. 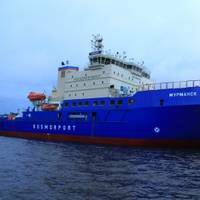 Repair of Polyarnaya Zvezda and Severnoye Siyaniye, semi-submersible mobile offshore drilling units (MODU) of the sixth generation, has been completed under survey of Russian Maritime Register of Shipping (RS) at Yantai CIMC Raffles Offshore Shipyard Ltd. in Yantai, China. Mr. Konstantin Palnikov, RS Director General, attended the ceremony of MODUs delivery to customer, which was held on April 15, 2016. During survey of the MODU repair and equipment replacement RS specialists performed docking survey, inspection of hull structures, ship machinery and disassembled devices. The tests and operation checks of the machinery, equipment and ship systems, as well as platform sea trials, were successful. 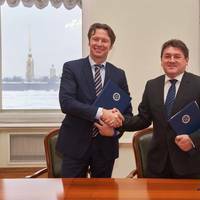 The meeting of the Scientific and Technical Council (STC) Presidium of Russian Maritime Register of Shipping (RS) was held on 15 December 2015. The STC is one of the crucial components to ensure the RS activity on rendering the wide range of services in the area of marine transportation safety. The Council consists of the Presidium and 14 specialized sections and incorporates over 300 scientists and highly qualified specialists from over 30 scientific, design organizations, shipping companies, shipbuilding yards.